The image left attempts to give some idea of how the exterior of Exeter's South Gate might've appeared today had it not been demolished in 1819. 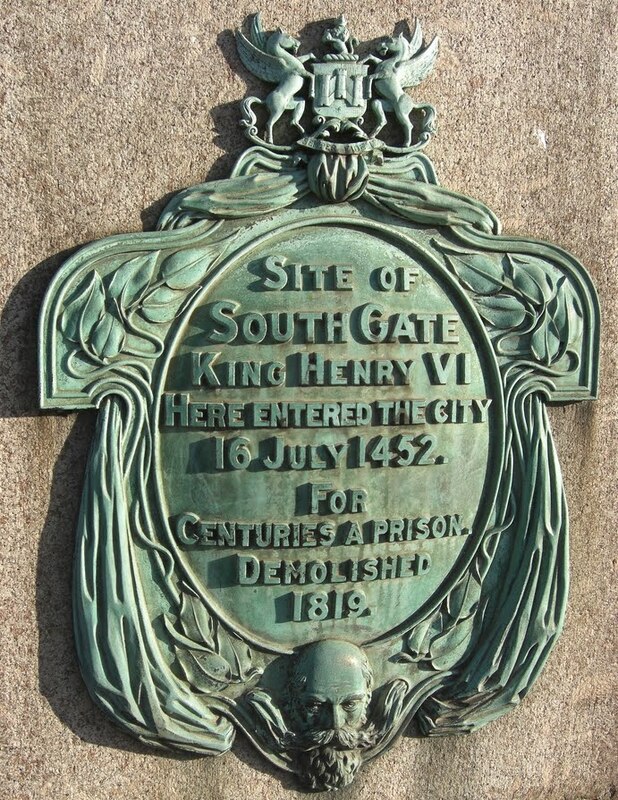 Located at the end of South Street, the South Gate was the main entrance into the city for nearly 1700 years. Built by the Romans, altered by the Saxons and rebuilt by the Normans, the gate acquired its final form in the Late Middle Ages and remained little altered until it was pulled down at the beginning of the 19th century. The first Roman gatehouse on the site was built c140 AD, a product of the transformation of Isca Dumnoniorum from a former military fortress into a civilian settlement. As the population had increased the perimeter of the settlement was extended outwards to cover the area still bounded by the city walls. A defensive ditch with an earthen bank topped by a wooden palisade was constructed around the newly-enlarged civitas. The Roman South Gate would've been part of this expansion and was originally built of wood. (Timber from this earliest incarnation of the South Gate was excavated in February 1989.) In c180 AD the wooden palisade and bank were replaced with a thick stone wall, parts of which can still be seen today, and the South Gate was rebuilt in stone at the same time. 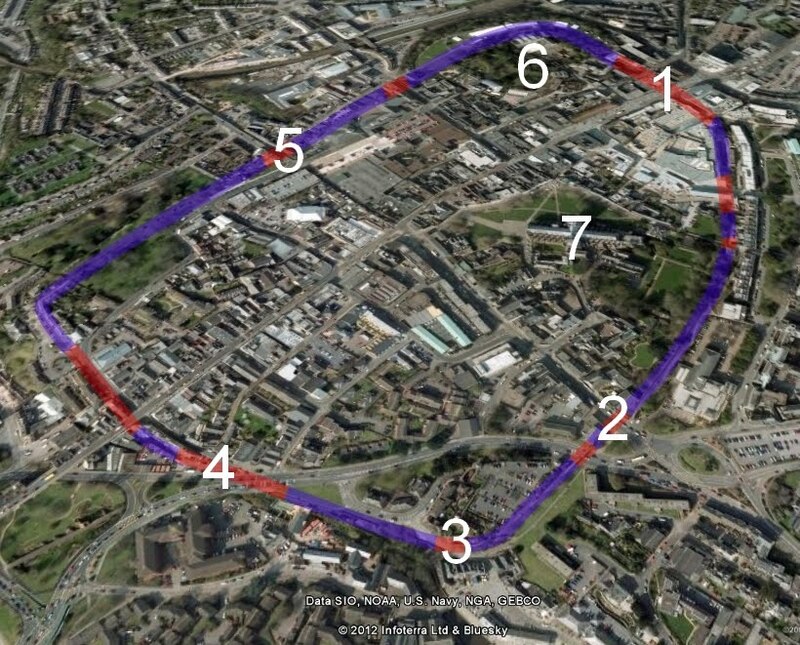 The aerial view of Exeter right shows the circuit of the Roman and medieval city walls highlighted in purple (missing sections are highlighted in red). No. 2 marks the former location of the South Gate. South Street can clearly be seen heading towards the city centre where it meets Fore Street, North Street and the High Street at the ancient crossroad known as the Carfoix. 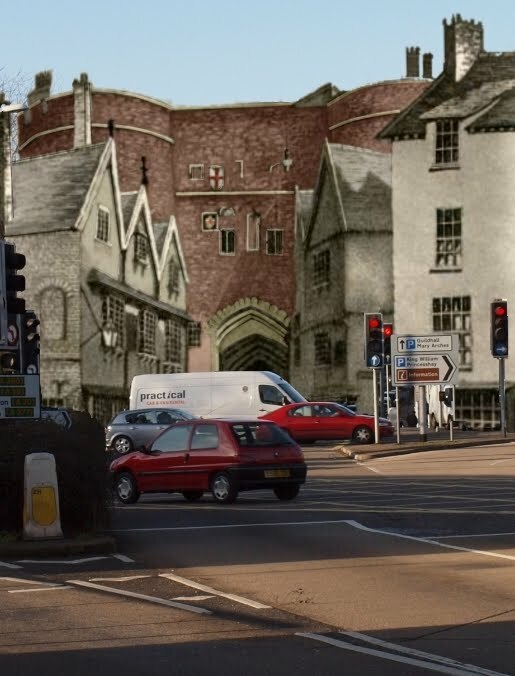 The Roman South Gate is the only one of Exeter's Roman gatehouses for which archaeological evidence has been found and its remains still lie beneath the modern road. The stone gatehouse consisted of two tall square towers flanking a central entrance. It was about 55ft (17m) wide, including both towers. Unfortunately very little is known about Exeter during the so-called Dark Ages, but the South Gate, along with the city walls, must've remained standing after the decline of the Roman administration of Britain in the early 5th century. When Alfred the Great refortified Exeter between 880 and 895, one of the measures taken to improve security probably included rebuilding the South Gate. 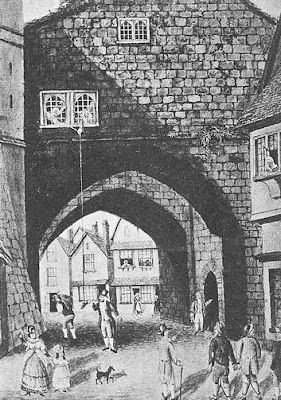 Christopher Hendersen in his 2001 paper 'The Development of the South Gate of Exeter and its Role in the City Defences' believed that the Anglo-Saxon gate was probably constructed primarily of timber but also included some "elements" of the old Roman gate that were still standing some 600 years after it had first been built. Hendersen also believed that the late 9th century gatehouse was itself probably rebuilt again, this time in stone, during the 11th century, either just before or just after the Norman Conquest. For some reason, perhaps French raids on the south coast of England, the South Gate received a massive overhaul between 1410 and 1420, transforming the earlier structure into what Hoskins called "one of the most impressive things of its kind in England". Like the outer face of the East Gate, the new South Gate was also probably built of the extremely durable grey/purple volcanic trap quarried from a variety of sites around Exeter. The early 15th century South Gate consisted of a bastion in the form of a rectangular block. The rear of the block lay flush with the line of the city wall and projected outwards over the old town ditch. The block was flanked on either side by huge drum towers, each tower being of four storeys and at least 50ft high. There was a drawbridge set into the carriageway and deep ditches ran away on either side. A central passageway some 16ft (5m) tall, the interior of which was constructed with rib vaulting, ran through the centre of the bastion and a niche on the outer face contained a statue. The exterior face also had arrow slits and carved shields set into square stone plaques. The towers were subdivided into separate rooms and there were also chambers in the part of the gatehouse that spanned the central passageway. When the Tudor antiquarian, John Leland, visited Exeter in 1542 he believed that the South Gate was "the strongest" of the city's four main medieval gatehouses although the East Gate was perhaps larger. Alexander Jenkins left an eyewitness description of the South Gate as it appeared in 1806: "The gate is a massy [massive] building of hewn stone. The entrance from the suburbs is through a lofty pointed arch, flanked by circular towers, over the gateway is a niche, where lately stood a mutilated statue in a magisterial robe; this front is likewise decorated with angels, supporting the Royal and City arms; the interior arch of the gateway from its semi-circular form, appears of Saxon construction, and is probably some remains of the ancient gate". The image above is one of the few surviving depictions of the interior elevation of the early 15th century rebuilding. 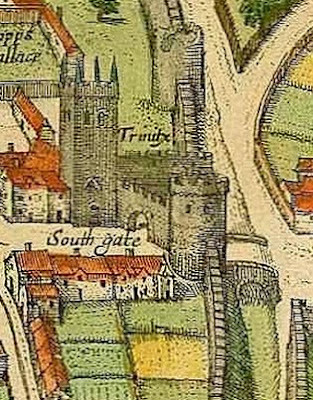 This view was obscured for centuries by the priest's house of Holy Trinity church which spanned South Street almost directly behind the gate. The drawing was executed in the very short space of time between the demolition of the priest's house and the gatehouse itself. 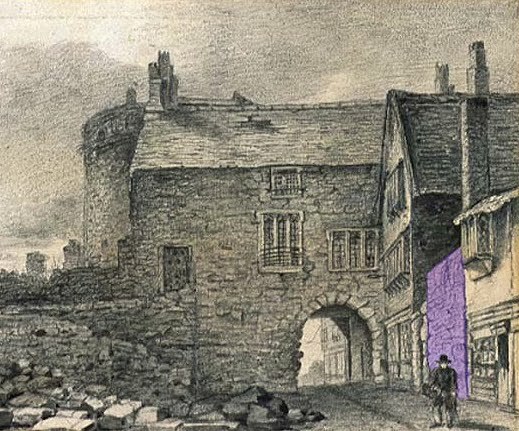 The location of what was probably part of the side wall of the priest's house is highlighted in purple. The semi-circular inner archway of the gatehouse is clearly visible. The north wall had stone mullion windows with what looks like cusped tracery. The upper chambers could be accessed from the top of the city walls via a doorway. The debris on the ground to the left is demolition rubble from the church and the priest's house. The fact that the exterior arch was pointed and the interior arch was semi-circular strongly suggests that the gatehouse built between 1410 and 1420 also retained elements of a much earlier structure. The disparity between the two styles of arch was noted in the 1720s by the English antiquarian William Stukeley. He wrote that "one arch of South-gate seems to be Roman", a surviving component of the gatehouse built one-and-a-half thousand years earlier. The idea that the interior arch of the late medieval South Gate was part of the original Roman building has been banded around ever since. As late as 1971 Aileen Fox wrote that "it is possible that the round arch that is shown on the inside of the South Gate in early nineteenth century prints was a Roman survival". Wacher went further in 1975 when he stated that the arch "almost certainly" dated to the Roman period. A partial excavation of the site in 1992 indicated that parts of the Roman gatehouse had been demolished by c1200. A small guide to the city walls, written in association with the Exeter Archaeology unit and published in 1998 maintained that "the archway was probably Roman". Chris Hendersen, in the above-mentioned paper of 2001, supported Jenkins' belief that the archway was probably late Saxon or early Norman and dated to the 11th century. Unfortunately, now the South Gate no longer exists, it's not possible to say categorically whether the arch was Roman or Saxo-Norman in date, although the latter seems most likely. 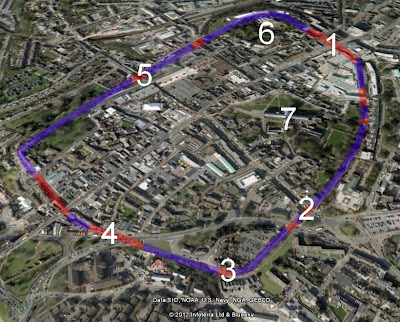 Chris Hendersen described the process whereby the Roman/Saxo-Norman arch at the South Gate might've been retained. Before it was rebuilt in the early 15th century, the exterior face of the South Gate was flush with the city wall and didn't project out from the city as it did after 1420. Following the construction of the bastion and the two flanking towers, what was once the exterior arch of the Saxo-Norman gatehouse became the interior arch of the early 15th century gatehouse. It probably didn't seem worth rebuilding a semi-circular arch that was being protected by the tremendous strength of the new outwork. This is perhaps why the new exterior arch was a pointed Gothic arch in keeping with the 15th century and yet the interior remained as an old-fashioned semi-circular arch, familiar to the Romans, Saxons and Normans. 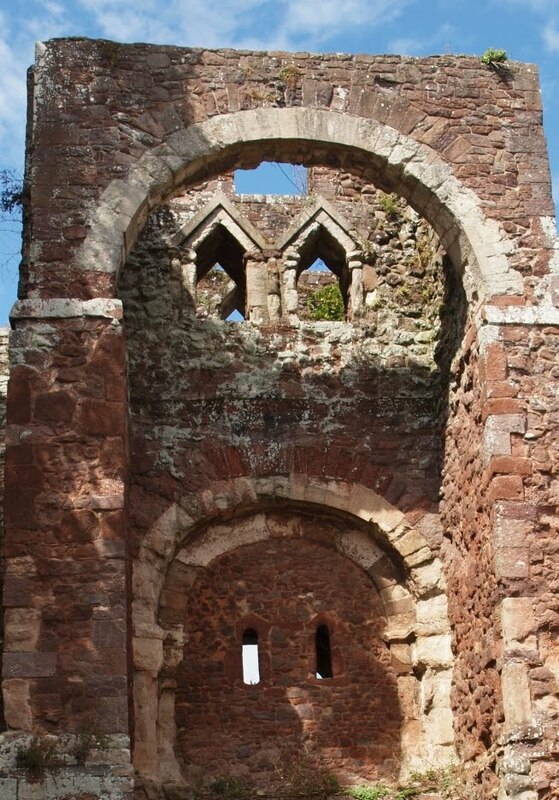 Two very similar archways to that which has prompted so much discussion still exist in Exeter at the gatehouse of Rougemont Castle above left. The two castle arches of c1068 are constructed from white sandstone. The interior arch at the South Gate was similar in appearance. 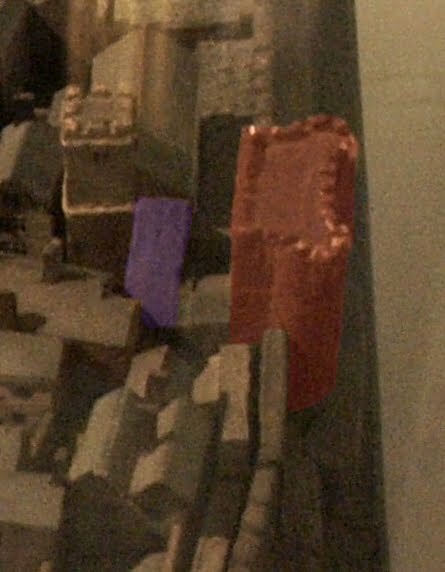 The general colour scheme of the castle gatehouse, with its contrast between the white dressed stone of the arches and the purple volcanic trap of the walls, is also very reminiscent of what would've been the colouring of the South Gate. Another uncertainty surrounding the architecture of the South Gate was the close proximity of the house used by the priest of Holy Trinity church. The church was sited just within the city walls, almost adjacent to the South Gate itself. 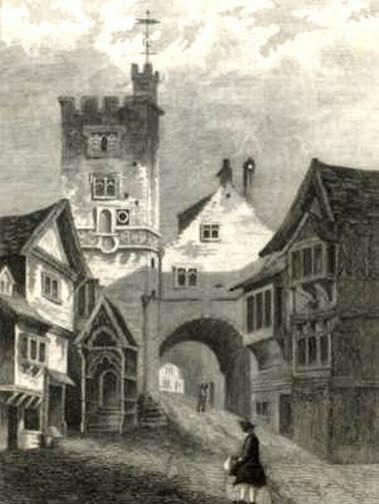 Jenkins complained in 1806 that the South Gate and the church's bell tower constricted the flow of traffic in and out of Exeter, a situation "rendered still worse by an arched building adjoining the tower, once the habitation of the Priest, but now of the Sexton". An 1853 article by William Harding also refers to this property. Harding cites a document relating to the parish of Holy Trinity dated 18 May 1615 which, according to him, "mentions also the Parsonage House, which was built over the king's high way; the entrance to which was by a Gothic door, forming an inconvenient projection into the street". This structure, with a pointed gable roof, is shown in the drawing above right. The arch of the South Gate itself can just be seen in the distance. The few surviving images of the priest's house suggest that it too had semi-circular arches but it was quite separate from the South Gate as a gap existed between the front wall of the priest's house and the back wall of the South Gate itself although the two were built of a similar material. 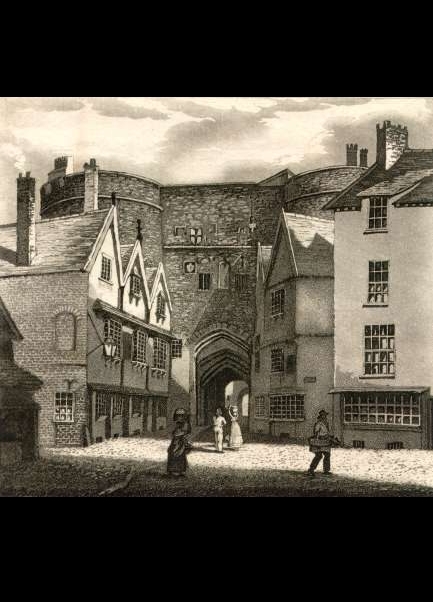 In fact, prior to 1819, anyone walking down South Street would've had their view of the South Gate almost completely obscured by the presence of the overarching priest's house. The South Gate and the priest's house were accurately depicted by Caleb Hedgeland on his early 19th century model of the city, a detail of which is shown left. The early 15th century reconstruction of the South Gate is highlighted in red. The priest's house is highlighted in purple connected directly to the church of Holy Trinity. Holy Trinity was itself remodelled around the same time that the South Gate was rebuilt. Was the priest's house originally part of the South Gate and only later used by the priests? Was it constructed at the same time or was it part of an earlier building? Unfortunately I can't find out much else about it. In c1600 the roof of the South Gate was strengthened to take guns and the height of the gate raised, but apart from these slight alterations the South Gate remained unchanged until the beginning of the 19th century. From the 16th century onwards the gatehouse was used as the city prison. The prison reformer, James Neild, visited the South Gate prison in 1806 and recorded that "it consists, amongst others, of two rooms in the Keeper's house called the Long Room and the Shoe". According to Neild, the Shoe received its name from a shoe that was hung by the prisoners from a length of string and suspended from "the iron-grated window towards the street". The idea was that charitable passers-by would put a small amount of money into the shoe (hence the phrase "living on a shoestring"). Neild recorded that the Shoe was used by debtors that "bring their own beds and pay six-pence per week". The image right is an early 20th century postcard depicting a fictional view of prisoners lowering a shoe to pedestrians. The artist has shown the prisoners as being incarcerated in the priest's house of Holy Trinity rather than the South Gate. The Long Room was used by the debtors for exercise, there being no courtyard. There were nine other rooms that could be let out by the jailer according to the debtors ability to pay. Jenkins reported that the room called the Shoe had formerly been a chapel as the remnants of the Ten Commandments, painted on the wall, could still be seen. He also believed that the debtors were sometimes allowed access to the tops of the towers, "which command a fine prospect", so they could enjoy some of the fresh air. The felons had a much worse time of it. Neild stated that "on the side opposite of the Gaoler's apartments are the three wards appropriated to the felons, dark, dirty and offensive; - we went into them with lighted candles: they have no chimney for ventilation; no courtyard belonging to them; nor water, except what was brought by the Keeper". There were three cells, two for men and one for women, located in the western side of the gatehouse. Jenkins related that these cells were all on the ground floor and "from their damp situation, and darkness, may not improperly be termed dungeons". The presence of an open sewer flowing from nearby Southernhay didn't add much to the comfort of those unfortunate enough to be imprisoned there. The largest felon cell was just over 12ft high, 18ft wide and 11ft deep. Above these cells were two day rooms with fireplaces accessed from below via a trap door. Jenkins wrote that John Howard, the 18th century prison reformer, believed that the South Gate prison was one of the "most unwholesome and dismal places of confinement" in England. In June 1818 the foundation stone for a new 'House of Correction' was laid by the mayor at Northernhay where the Rougemont Hotel now stands. 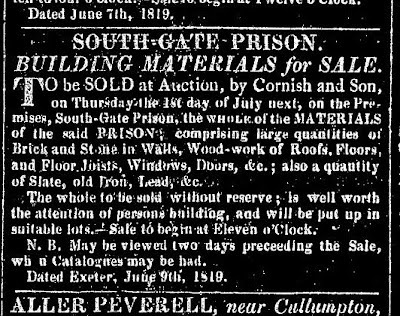 According to the 'Exeter Flying Post', the mayor declared that the construction of the new prison would take approximately 12 months "when the completion of their labours would be the destruction of a building which has long outraged humanity, and disgraced the city of Exeter". It's likely that the gatehouse would've been removed irrespective of the presence of the prison itself. All of the city's other medieval gatehouse had already been removed for street improvements and the South Gate was the last one to go. 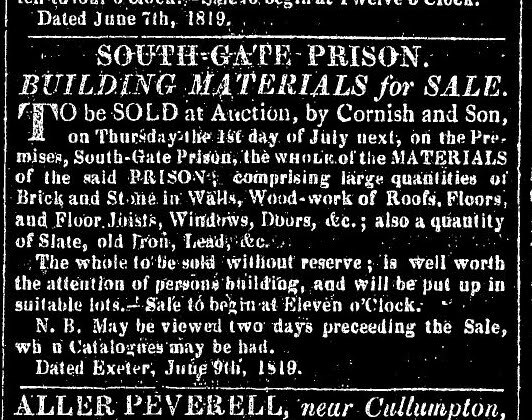 Exactly one year later, in June 1819, an advertisement right appeared in the 'Exeter Flying Post' announcing the sale of building material from the South Gate, comprising bricks, stone, woodwork, floor joists as well as doors, windows and slate and lead from the roof. 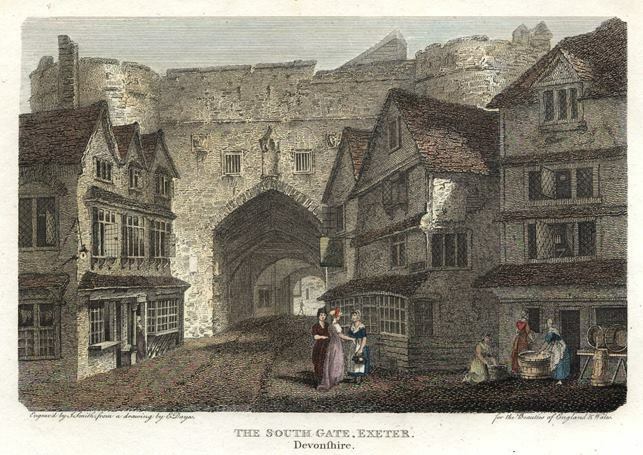 Parts of the South Gate must still exist in Exeter, spread around the city in various houses. (Old beams from 17th century houses demolished outside the South Gate in the 1970s were reused in a similar way e.g. at a house in Sylvan Road, Pennsylvannia.) The priest's house of Holy Trinity was demolished, along with the church, at the same time. As with the slum clearances at the beginning of the 20th century, although the philanthropic sentiment can't be faulted it's impossible not to regret the demolition of the South Gate. As Hoskins wrote, "it's a vast pity that this magnificent gateway, one of the most impressive things of its kind in England, should have been destroyed like this and not by-passed as it could easily have been. Through this gateway many kings of England had passed from William the Conqueror onwards: it ranked with the cathedral, the castle, and the guildhall, as one of the grandest monuments to the Middle Ages in Exeter". The only city gatehouse left in England that was similar to the South Gate at Exeter is probably the surviving West Gate at Canterbury (the many surviving medieval gatehouses in York are of a quite different design). The site today is marked by a late 19th century bronze plaque. 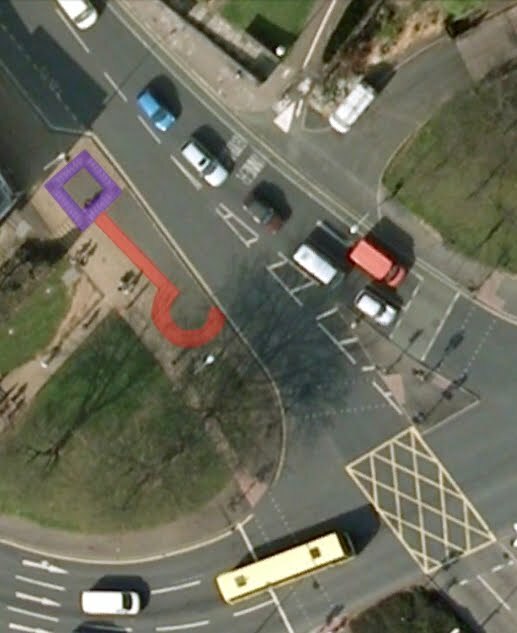 The footprint of one of the square Roman towers and one of the early 15th century drum towers is marked out on the pavement in brick, highlighted in purple and red on the aerial view above left. Unfortunately the approach to the gate, an area that survived the Exeter Blitz of 1942 and which contained many historically interesting properties from the 17th and 18th centuries, has been totally spoilt by the construction of the inner bypass in the 1960s and 1970s. But that's a whole different story. The small village of Doddiscombsleigh lies about five miles southwest of Exeter. The village is locally notorious for being difficult to find, despite its proximity to the city. It's surrounded by twisting narrow lanes and deep valleys with the foothills of Dartmoor stretching away to the horizon. 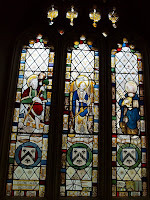 Remarkably, apart from that in the Great East Window of Exeter Cathedral, the parish church at Doddiscombsleigh contains the greatest collection of medieval stained glass to be found in situ anywhere in Devon. 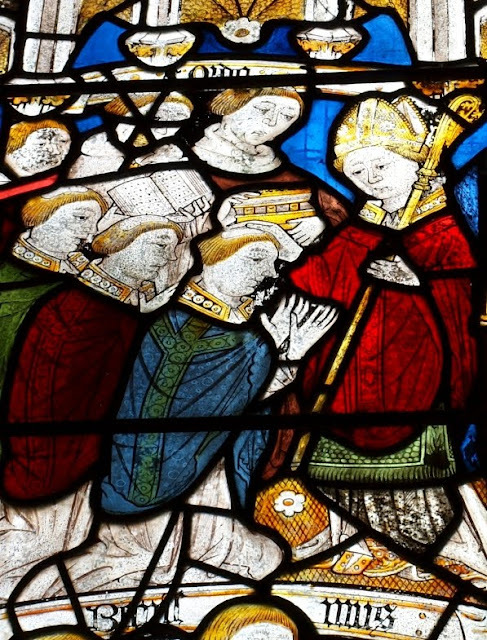 Of particular interest is the fact that the Doddiscombsleigh panels and some of the glass at Exeter Cathedral were produced in the 15th century by the same glazing workshop. The Doddiscombsleigh panels were installed c1480 and consist of five windows in the north aisle of the church of St Michael. This aisle was the original site of the 10th or 11th century church. (Part of the Saxon long-and-short work is still visible in the exterior of the north wall. This makes St Michael's one of the handful of extant buildings in Devon where Saxon masonry can still be seen.) The four windows in the north wall consist of groups of standing figures under which are heraldic shields. 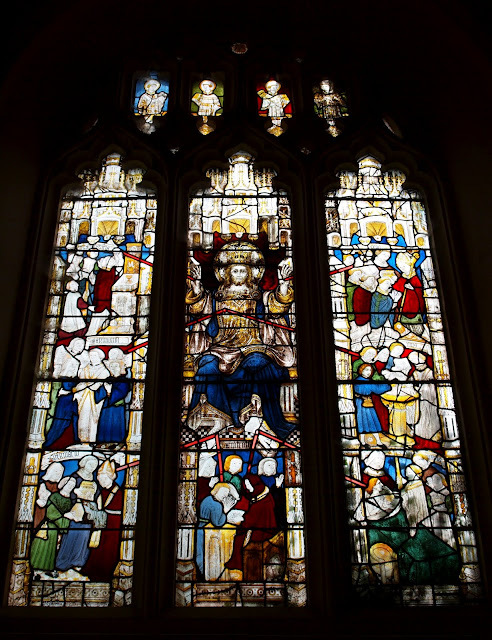 The window in the east wall of the aisle contains a single window depicting the Seven Sacraments, described in the church's guide book as St Michael's "crowning glory". 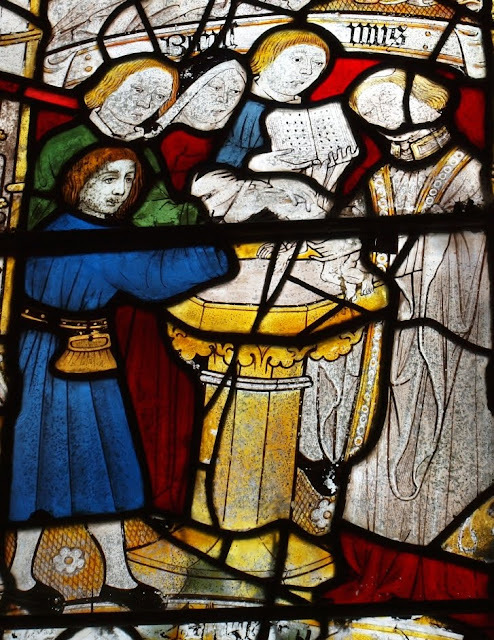 Although the workshop that produced the glass is now often referred to as the 'Doddiscombsleigh artelier' or 'Doddiscombsleigh school', the panels weren't made in the village. The village just happens to possess the best surviving examples of the workshop's output. In fact the workshop was almost certainly based in Exeter and comprised a number of people working on many different commissions. 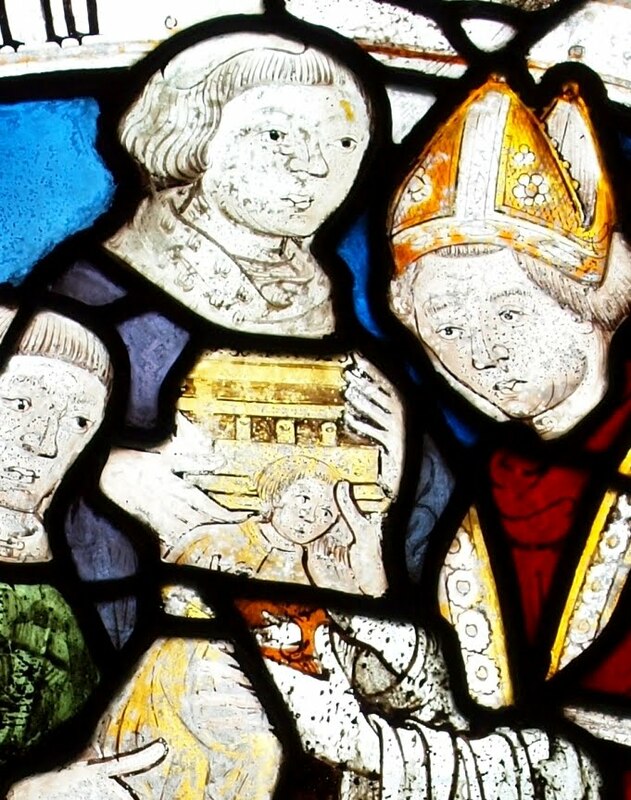 Although the glass produced by the workshop exhibits a general similarity in style, experts in medieval glass have been able to distinguish the hand of individual artists. The workshop executed panels for churches all across the southwest of England. Fragmentary examples still exist at Bratton Clovelly, Dunsford, Manaton and Cadbury, all in Devon, as well as Melbury Bubb in Dorset and Winscombe, Pitcombe and Langport in Somerset. 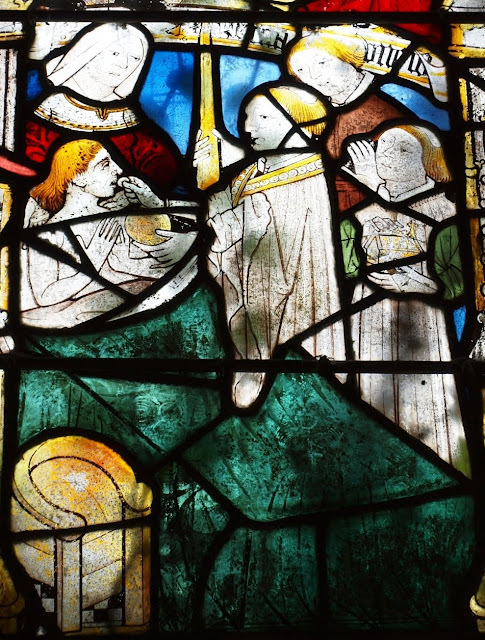 The workshop also received an important commission from the Dean and Chapter of Exeter Cathedral in the late 15th century for a glazing scheme for the cathedral's chapter house (these very beautiful panels were transferred to the Great East Window in the 19th century where they can be seen today). 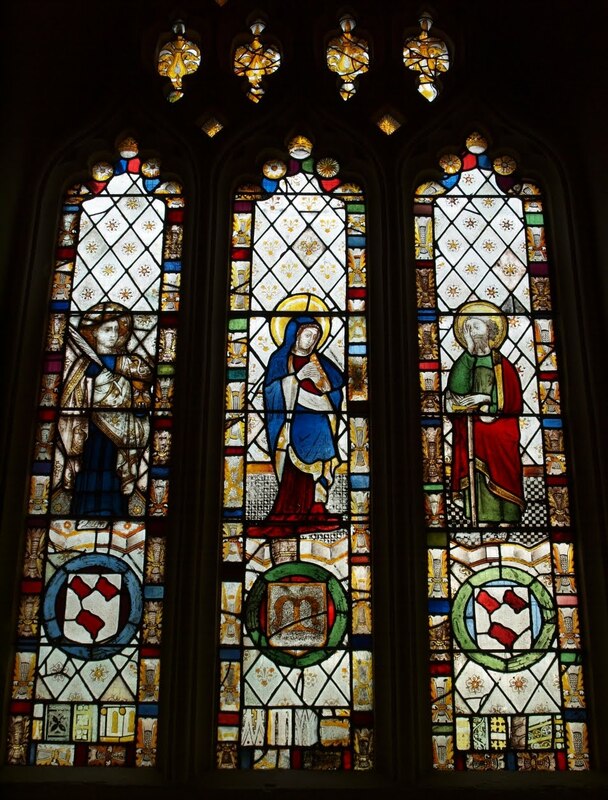 The windows at Doddiscombsleigh have been restored at least twice since the 15th century. Once in 1762 by Peter Coles, who also restored some of the glass in Exeter Cathedral, and again in 1877 by a firm called Clayton & Bell when anything between 15% and 20% of the panels were replaced with newly-painted glass and the four windows on the north wall underwent some rearrangement of the figures. So not all of the panels have survived intact, but given the destruction of the Reformation, the English Civil War, the Puritans, general neglect and five centuries of wind, rain, frost and sun, not to mention the scarcity of existing medieval glass in Devon generally, and it's almost miraculous that any of the glass has survived at all! According to Vidimus, the online magazine dedicated to medieval stained glass, tracings were made of the windows by an antiquarian in 1847, prior to the restoration of the 1870s. From these tracings it's possible to reconstruct something of the original scheme before some of the panels were rearranged and new figures inserted. The panels featuring St John the Evangelist, St Patrick and St Edward the Confessor are entirely the work of Clayton & Bell. The head of the Christ child being carried by St Christopher is also a Victorian addition, as is the head of St Paul. 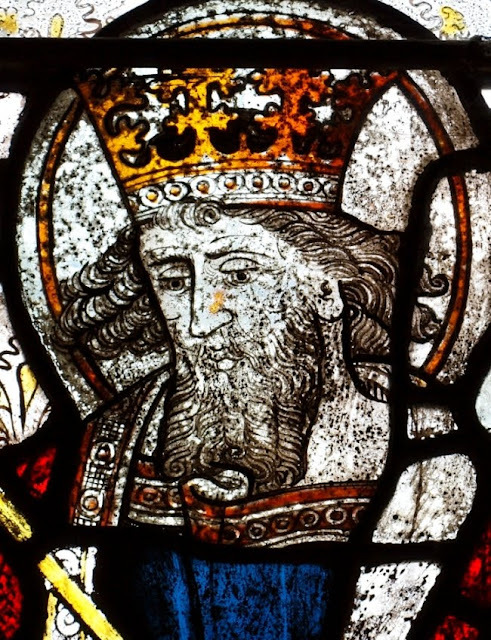 The 19th century figure of St Edward the Confessor is particularly impressive, the head right being slightly reminscent of Robert Lyen's work on the East Window at Exeter Cathedral at the end of the 14th century. 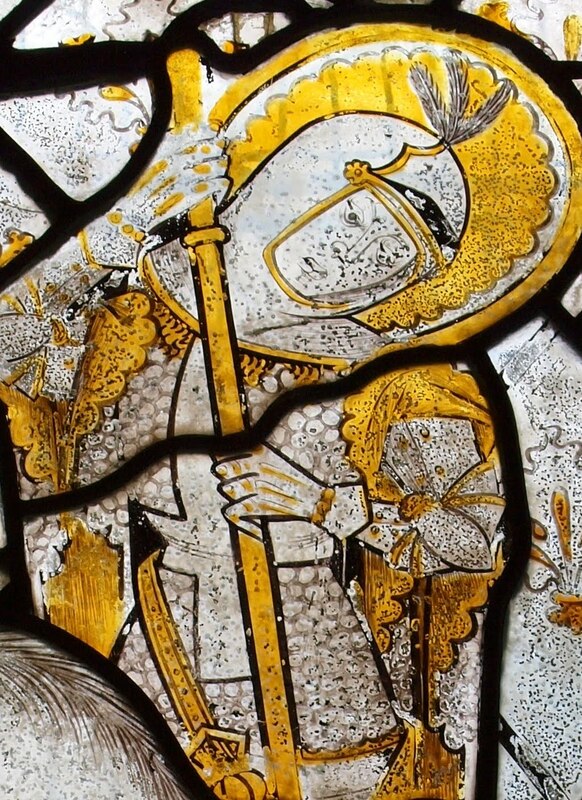 Although it doesn't quite capture the stylistic quality of the genuine 15th century panels at Doddiscombsleigh, the figure demonstrates how successfully Victorian craftsmanship could mimic medieval stained glass. The glass was artificially aged using various techniques so that it blended more convincingly with the medieval survivals. The fifth window left is the finest of all and is of national importance. It depicts the Seven Sacraments of the Church, seven separate panels depicting one sacrament each. In the centre of the scheme was originally a figure of Christ from which emanated lines of red glass, symbolising blood streaming from wounds of Christ and connecting each of the sacraments to God. Unfortunately the central Christ figure had been removed at least by the end of the 18th century and replaced with clear glass. This was allegedly done at the behest of a local farmer who had a pew under the window. He complained that the large figure obscured the light so much that it prevented him from reading his Bible. The space occupied by Christ remained empty until the current figure was installed by Clayton & Bell in the 1870s. Comparison with a tiny fragment of a similar Seven Sacraments scheme from the same workshop that once existed at St Michael's at Cadbury near Exeter has shown that Clayton & Bell were probably incorrect in representing Christ as sitting, facing towards the viewer. The original panel probably showed Christ standing, facing slightly to the left. Despite this Victorian addition, the panels depicting the Seven Sacraments themselves have remain largely unaltered since the end of the 15th century. The order of the Seven Sacraments in the window is as follows, starting in the top left and going anti-clockwise: The Eucharist shows a priest holding aloft the Eucharistic bread. The congregation crowd behind as he kneels before an altar draped in white and gold cloth upon which are placed a chalice and a statue of the Madonna. Below this is the Sacrament of Marriage depicting a couple being married by a priest at the moment when the ring is placed on the bride's finger. To the bottom right is the Sacrament of Confirmation, the red-robed bishop wearing a mitre (a detail from this panel is shown above, the third photo from the top). The central panel at the bottom of the window depicts the Sacrament of Absolution and shows a priest sitting on a wooden bench, dressed in a red cowl and hearing the confessions of a sinner, his hand placed on the sinner's head in an act of absolution. The top right panel is the Sacrament of Ordination with a bishop carrying a crozier seated before three newly-ordained priests as three others watch on in the background (this panel is shown at the top of this post). Beneath is the Sacrament of Baptism, the infant being held over a Gothic font and surrounded by a priest and four adults, probably the parents and godparents, above right. The seventh panel shows the Sacrament of Extreme Unction left, a dying man propped up in bed as he receives sacramental bread from a priest, his wife in the background, a chair standing near the bed on a floor of black and white tiles. 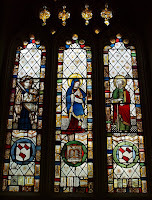 The four small figures at the top of the window, above the main lights, depict St Stephen, St Lawrence and St Blaise. The forth is believed to be either St Heydrop or St Nicholas. When Clayton & Bell restored the window in 1877 they believed "the scheme of the window to be entirely unique, never having seen anything like it in England or abroad". In fact the remains of several other Seven Sacrament windows do still exist. 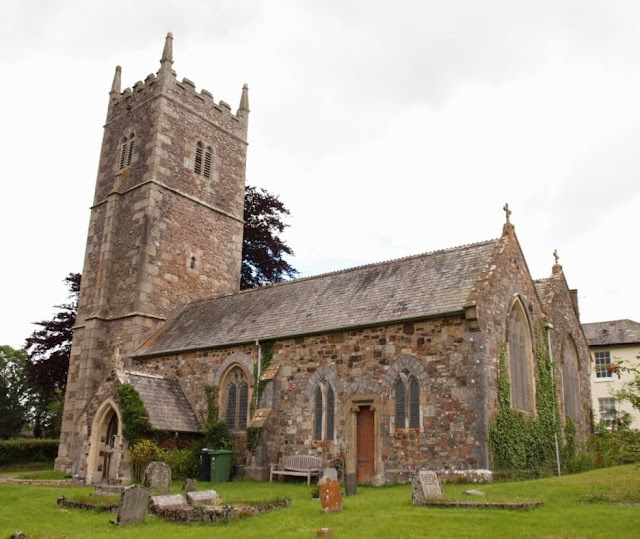 As mentioned above, there was a very similar scheme at Cadbury and fragments of others can be seen at St Trynog's in Llandyrnog in Wales, Cartmel Fell in Cumbria and Melbury Bubb in Somerset. 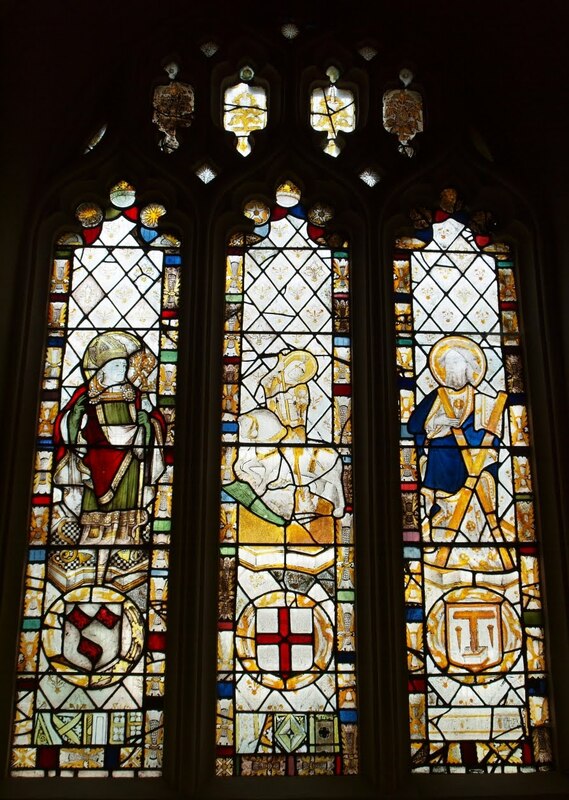 But the Vidimus website states that the window at Doddiscombsleigh is "the most complete in situ composition of the Seven Sacraments in any English church". 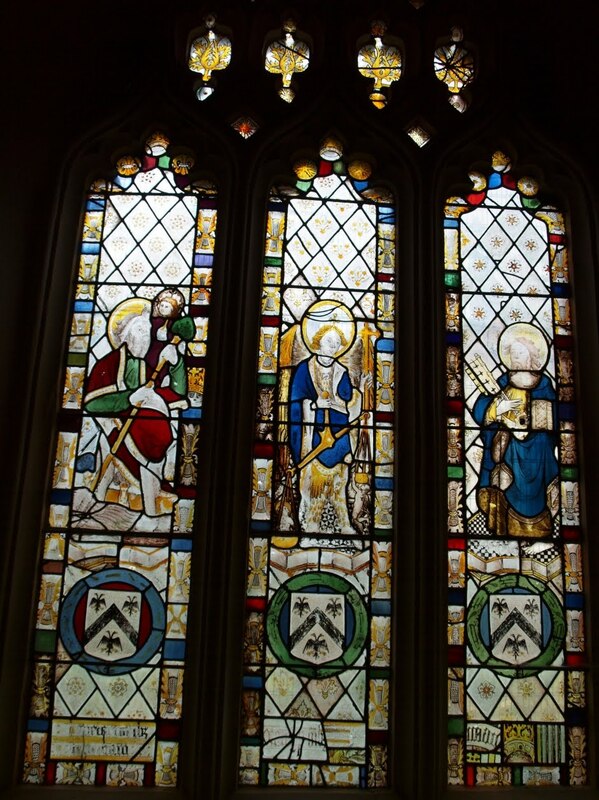 Full images of the other four windows containing medieval panels are shown below. 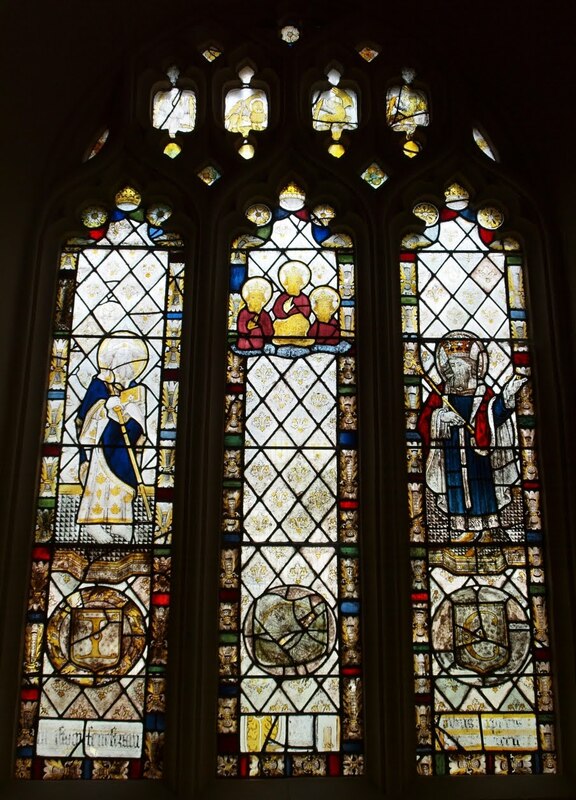 These panels left Exeter over five hundred years ago, around the time of the Wars of the Roses, transported out of the city during the Late Middle Ages on a cart and hauled up and down the precipitous hills of West Devon before being installed in the church for which they were made. And they remain there today, rare survivals of perhaps the most fragile of medieval art forms. Exeter has lost a number of its central medieval parish churches. St George's and St Kerrian's were demolished in the 19th century. Allhallows, St Paul's and St John's were all demolished in the first four decades of the 20th century. 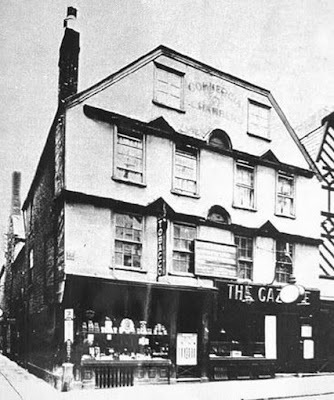 St Lawrence on the High Street was badly damaged during the Exeter Blitz of 1942 and subsequently demolished. St Mary Major's was demolished in the 1970s. The churches of St Petrock's, St Mary Steps, St Pancras's, St Olave's, St Stephen's, St Mary Arches's and St Martin's still survive. All of these buildings, from their ancient foundations through their subsequent development, tell the story of Exeter's history over the last one thousand years. Over the centuries each church accrued collections of plate: chalices, salvers, flagons, communion cups and patens, made of either pewter or silver, often bequeathed by wealthy benefactors to be held by the church in perpetuity. When a church was demolished or destroyed that church's plate frequently found its way into another church where it became part of a new collection. Dwindling post-war congregations means that the churches of St Stephen's, St Petrock's, St Pancras', St Mary Arches and St Olave's now form a single entity known as the Parish of Central Exeter. The PoCE has control of nearly all of the church plate from the medieval parish churches, both from the churches that still survive and those that have disappeared. In February 2012 a spokesman for the Dean and Chapter told a local journalist that the PoCE had asked for permission to sell twelve of the pieces. Permission was granted but the true extent of the sale remains uncertain. 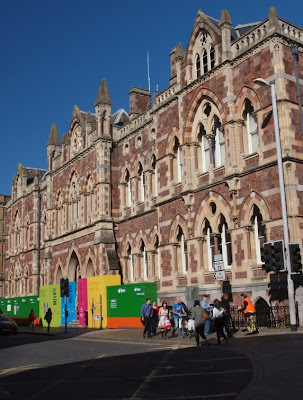 Keith Walton, a church warden, told the local paper that "we assessed all of the items that are held and have only put forward those with the least significant historic interest for Exeter". John Allan, one of Exeter's most senior archaeologists, has written an article especially for the catalogue of the planned sale of the silver. In the article he states that, in some cases, all that survives of some of Exeter's oldest churches is their plate. So let's see exactly what is being sold at auction on 11 July. The first item is a silver communion cup made c1575 by Exeter's most celebrated Elizabethan goldsmith, John Jones. (This item is shown at the top of this post.) Examples of his work are on display at the Victoria and Albert Museum in London. The cover is engraved with a Tudor rose and was used as a paten. The cup held the consecrated wine and the bread was laid on the paten. It is inscribed: "Entrusted to the Church Wardens of St Petrock by The Parish of St Kerrian, May 1884". St Kerrian's church on North Street is first mentioned in 1194 but was demolished in 1878. This is almost certainly the communion cup and cover that was used in St Kerrian's church for three hundred years, possibly fashioned by John Jones out of a pre-existing medieval chalice. 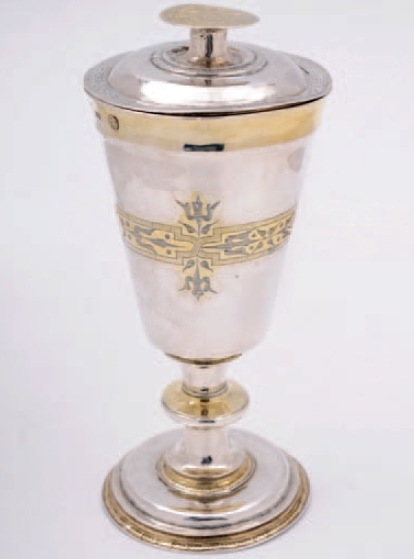 In the auction catalogue, John Allan states that this cup is probably the church's "most important surviving relic". 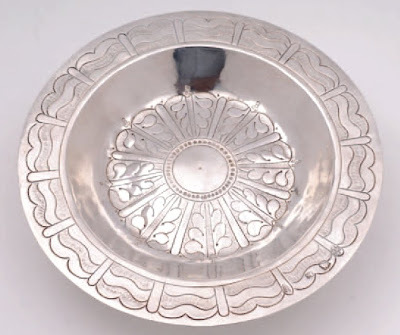 The second item is another Elizabethan silver communion cup with cover also by John Jones c1575 left. 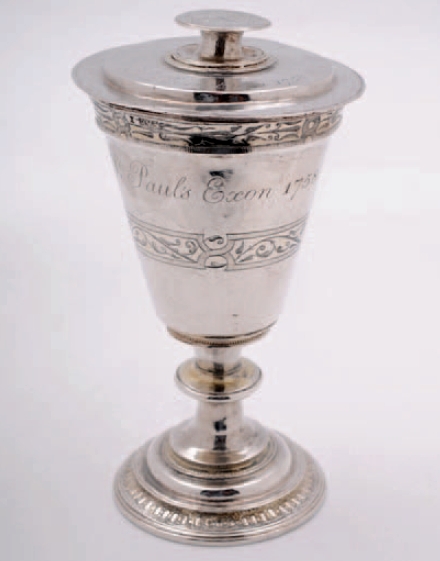 This cup is inscribed "St Paul's, Exon, 1758". Like St Kerrian's, the church of St Paul on Paul Street had ancient origins stretching far back into the city's past. The communion cup was once again perhaps reformed from a medieval chalice. The cup was in use before the church was rebuilt in the 1680s and it survived both the Commonwealth which followed the English Civil War and the demolition of the church in 1937. As in the case of St Kerrian's, this communion cup is the most important surviving remnant of the church along with its parish registers. Other items relating to St Paul's church are in the planned sale. A pair of George II silver flagons made in London in 1758 and inscribed "St Paul's, Exon, 1758" are also to be sold along with two late 17th century silver patens, made in Exeter by John Dagge and inscribed "St Paul's, Exon, 1758". A silver paten from 1658 that was used in the bombed church of St Lawrence, inscribed "St Lawrence, 1690" is in the auction, shown bottom. Another piece associated with St Lawrence's is a silver flagon with a domed lid, made in London in 1735 and inscribed "The Gift of Mr Robt Dawe to the Church of St Lawrence in Exeter, A.D 1735". Yet another silver flagon, made in London in 1692 and inscribed "St Martin's in Exon" is also going along with two silver flagons made late in the reign of Charles I. They are inscribed with "St Stephen's" and the date 1664, commemorating the year that the church was rebuilt following severe damage during the Commonwealth. What John Allan calls "historically one of the most interesting items in the sale" is a silver flagon that was given to St John's church by Thomas Potter in 1694. The idea that the two Elizabethan communion cups, particuarly, fall into the category of "least significant historic interest" is risible. They were at the very centre of the liturgy at St Kerrian's and at St Paul's for over sixteen generations and played an integral role in the religious experience of thousands of Exeter's citizens. You don't have to be religious or belong to any particular denomination to realise that these two items are of profound importance to Exeter's heritage. They are history incarnate and that they are now to be sold off is reprehensible. It is no different to the sale of the Elizabethan and Jacobean interiors at No. 229 High Street right in 1930 to William Randolph Hearst, an act which has been widely condemned ever since. It would be like the cathedral selling Leofric's 'Exeter Book' of Anglo-Saxon literature or the city council selling the civic regalia and the sword presented to the city by Henry VII. Both items, like the two communion cups and other pieces of church plate, are inextricably linked to the history of Exeter. The Parish of Central Exeter may well be the legal owner of the two John Jones cups and the other items but by putting them up for sale it has proven itself to be an unfit custodian of the entire collection. Irrespective of the inclusion of the communion cups, the sale of even one part of the collection throws the future of the entire collection into doubt. Now it has been dipped into once then who is to say that other pieces won't be sold the next time that more money is needed. The PoCE's website refers to "the first auction" taking place on 11 July which implies that more auction sales are imminent. It's ironic that the PoCE used the phrase "St Stephen's church has been here for a thousand years and belongs to us all" as part of its fundraising campaign. A sense of collective ownership could equally be applied to elements of the church plate that is being sold. A small story about the sale appeared in the Express & Echo in March 2012, which is when the untruth was told concerning the pieces of "least significant historic interest". It's only recently that the presence of the communion cups in the sale has become public knowledge. Clearly there's a real possibility that everything in the collection will eventually be dispersed. If the communion cups of St Paul's and St Kerrian's can be sold then anything can be sold. 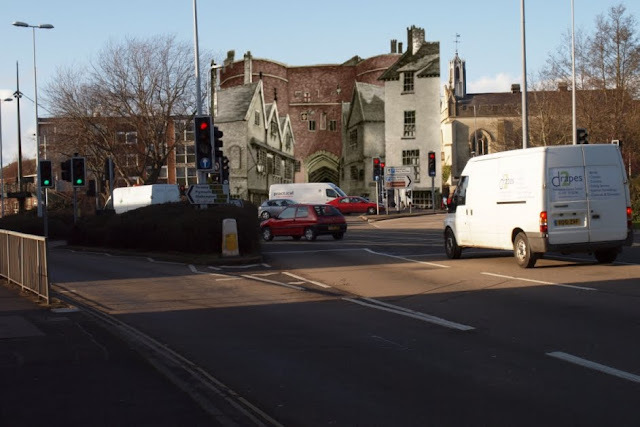 It is extremely disappointing that attitudes towards Exeter's heritage seem to have changed so little when so much has already been irretrievably lost.